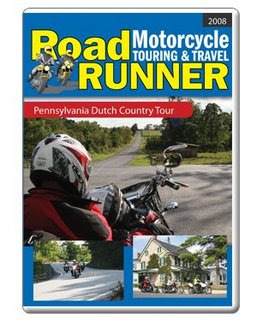 RoadRUNNER magazine's "Pennsylvania Dutch Country Tour 2008" DVD is a professionally-done, slick little piece of Hi-Def fun that left me wanting more. It's also a bit of torture as it's the dead of Winter and I've only been on two wheels for commuter duty lately. The camera and an animated map documents Publisher Christa Neuhauser, her son Florian Neuhauser and Senior Editor Chris Myers on a 4-day loop around the southeastern PA "Dutch" or "Amish Country" (if you're not familiar with the Amish, Google will reveal all). The viewer is along for the ride as they swoop and twist thru vast farmlands and visit interesting, delicious(!) and downright quirky destinations. Even though I live nearby and ride in the PA Amish Country all the time, I still discovered a few new things in this DVD, which will undoubtedly lead me to search out some new territory and places on future rides; that alone is well worth the $19.95 price of admission. I only wish the DVD ran longer. Click on the preview below; then order your DVD here. Images and video courtesy of RoadRUNNER, used by permission.